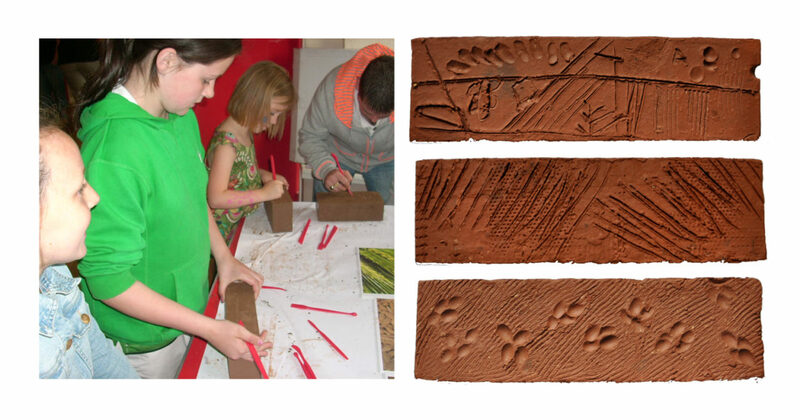 Collective Architecture were commissioned by Balornock East Residents' Association in 2009 to undertake a feasibility study to provide a new community facility as the existing and well used building is reaching the end of its useable life. The brief required a design that included a cafe, multi functional hall, offices and 3 shop units for the existing shops to be relocated. 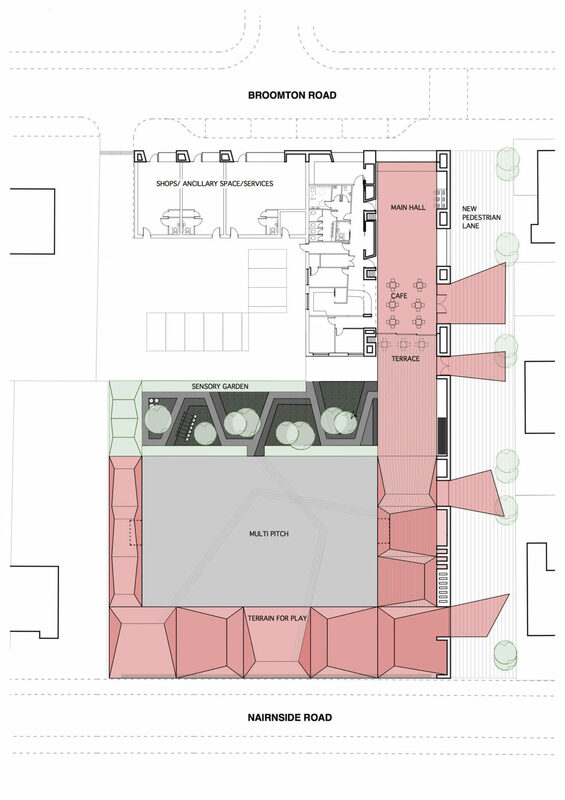 The proposal also includes a large external public space designed to connect with the community cafe and hall. The immediate area surrounding the site is currently being demolished and new housing built in its place. 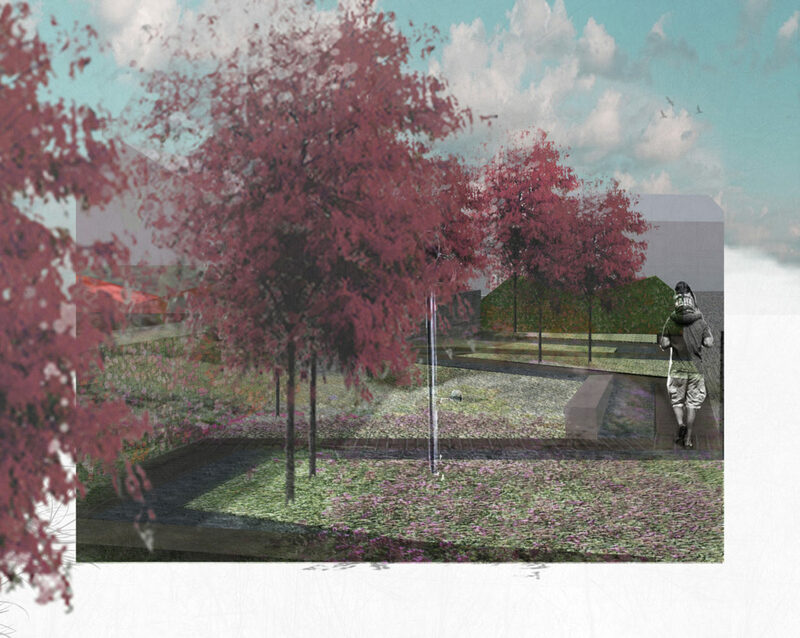 With no direct context for the proposals inspiration has been drawn from references to iron ore mines which used to exist in the area and the walled garden of Auchinairn House which historically sat on the site of the new community centre. The Gaelic meaning of Auchinairn is purported to mean either field of barley or field of iron. 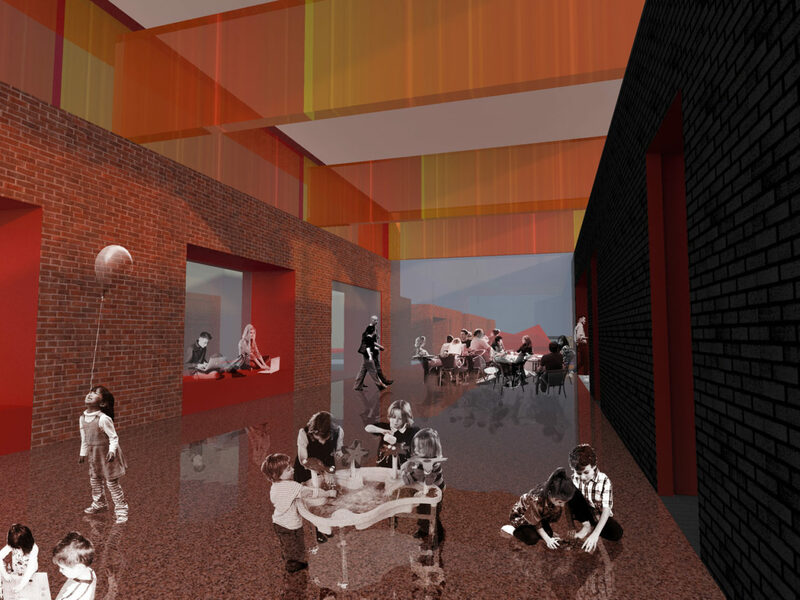 The building is composed of four distinct elements:Black textured brick to the shops and ancillary spaces; Red clay brick wall to the main hall and café space that forms the building boundary to a new pedestrian lane; A red curtain of semi-transparent material experienced as a slab that forms a roof to enclose the café space and main hall; A series of large openings edged in ‘red oxide’. 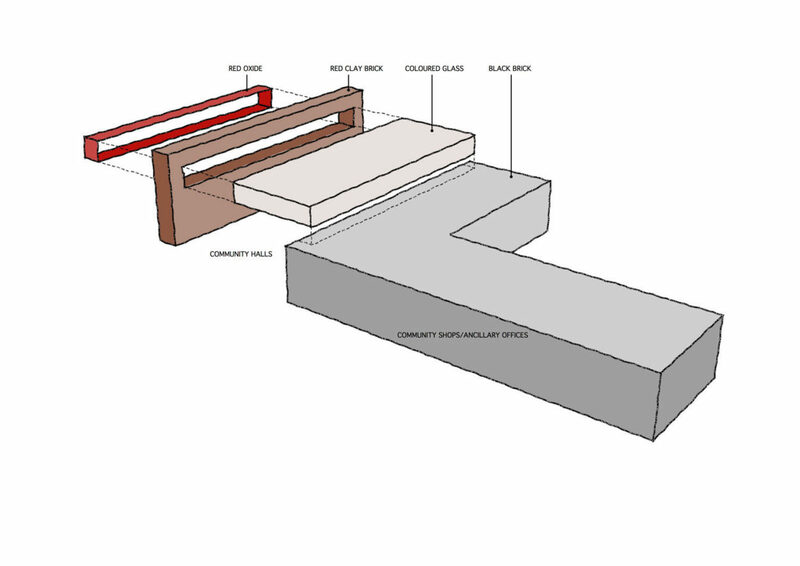 It is intended that the red clay bricks are unfired and will allow the members of the community the opportunity to alter the look of the bricks prior to firing, a series or workshops to test this idea have already successfully taken place on site. 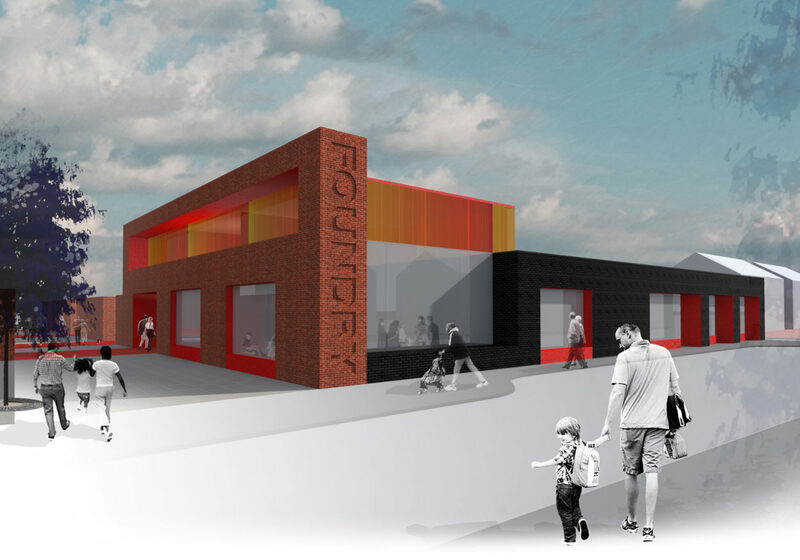 By creating the actual building units for the new community centre it is anticipated that this will engender a feeling of ownership amongst the community. 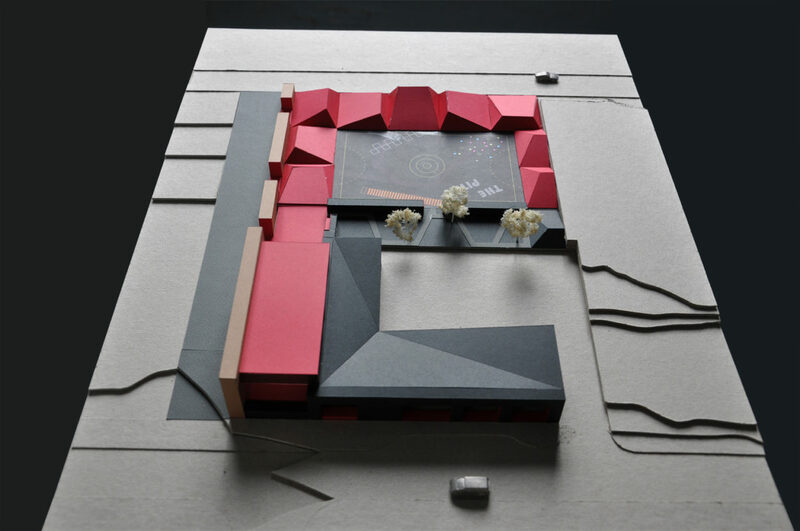 The form of the building is designed to optimise interaction between its interior and the new civic spaces surrounding it. The interior of the hall and café is visible from the new pedestrian lane through a semi-permeable wall. The intent is that the community activity within the hall is a welcoming presence for passers-by creating a sense of place and feeling of activity. Both internal and external spaces are dominated by a distinct palette of red materials referencing the history of iron mining in the area. The landscaping proposal is envisaged in terms of highly articulated, terraced landforms echoing large scale open mines. These geometric forms are intended as a terrain for play, encouraging a creative and interpretative use while forming a striking boundary between the public space and the new residential development.